The letters in brackets indicate the part of the building in which the majority of each department can be found. As there is only limited parking in the underground garage at Building J and on the parking deck next to Building W, we recommend that you contact the faculty or person you are visiting in advance if you intend to come by car. 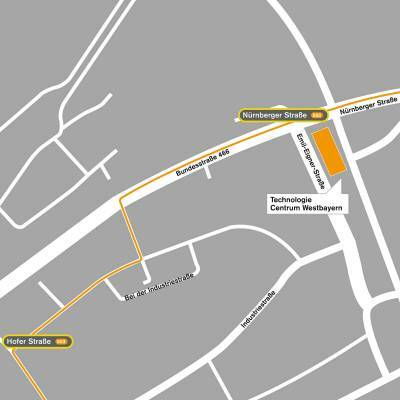 The parking deck next to Building W is accessed via Friedbergerstrasse 4. Tram 2,3 and 6, bus 35 - stop "Rotes Tor"
Tram 6, bus 32 und 35 - stop "Hochschule Augsburg"
Tram 2 and 3 - stop "Haunstetter Straße BF"
ICE and IC trains arrive hourly from all major German cities and destinations around the country. Some trains also stop at Haunstetter Strasse station, located right next to the Brunnenlech campus. The Rotes Tor campus is just a ten-minute walk from the Haunstetter Strasse station. For further information about train departure and arrival times, please go to the Deutsche Bahn website: www.bahn.de. The easiest way to reach Augsburg by plane is to fly to Munich Airport. Munich’s main station is a 45-minute journey from the airport by suburban railway, taxi or airport transfer bus. There are at least 2 connections per hour from Munich to Augsburg’s main station. Some of these trains even stop at the Haunstetter Strasse station, right by our Brunnenlech campus. It is a further 10-minute walk from there to the Rotes Tor campus. Click here for public transport connections to our campuses. For rail connections, visit www.bahn.de.